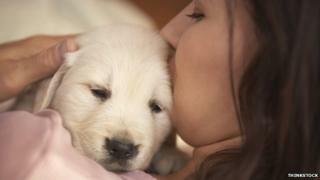 A puppy room to "aid relaxation and calmness" is being offered to stressed students at the University of Bristol. Several hundred have signed up and organisers say they are hoping "the cute pups" can provide respite from the stresses and strains of revision. About 20 dogs and puppies will be rotated throughout the day on 18 May, with students offered 15-minute slots. Three other universities - Nottingham, Aberdeen and Central Lancashire - have also offered puppy rooms in the past. Each student is asked to make a donation of around £2 to the charity Guide Dogs, which is helping run the events. Gordon Trevett, from the University's Centre for Sport, Exercise and Health, said: "Every year I see students fretting about their exams and I thought this would be a great way to ease the stress and take their minds off it. "People with dogs have lower blood pressure in stressful situations than those without a dog and we know that playing with a dog can elevate levels of serotonin and dopamine, which calm and relax. "It's proved really popular and over 600 students have signed-up." The Guide Dogs charity said it was "most pleased" to be working with the University of Bristol and allowing a chance for its students to de-stress at a busy exam time. The university said research published in Japan suggested pictures of "cute things" such as puppies or kittens can help improve concentration levels and performance. Jo Woods, from Bristol Students' Union, said: "While I'm more of a cat person myself, I'm really excited that the university is providing this for students. "It's really important to do fun and different things to de-stress during exams and cuddling a puppy is a perfect way to release some endorphins."